The truth of the matter is that Toastmasters is a fantastic global organisation which promotes improvement of speaking, presentation and leadership skills in a ‘safe’ environment. There are over 100k members and 100s of clubs worldwide. The concept has something to offer to everyone – from seasoned presenters to total novices. I have recently started up a Toastmasters club in my organisation. Local members from other clubs have helped to get the club up and running and train new members. By registering the club with the Toastmasters International organisation, we have access to manuals, textbooks, meeting materials and a fantastic support network. Meetings are very structured and have something to offer to everyone. There are various assigned roles in each meeting – from evaluators to time keepers – and from running the meeting to giving a speech. Toastmasters incorporates structured and prepared speaking alongside the impromptu ‘Table Topics’ – a session where members are asked to give 1-2 minute talks on an unknown topic. There is also various programs that you can work through in order to gain competent communicator status and other titles (which are actually globally recognised). To summarise, even if you think that you are a good speaker/presenter, there is always something to learn. The club will push you just outside your comfort zone and help you to extend it. The skills and confidence that can be learned from impromptu speaking are particularly valuable for the next time when you get asked a question off-guard, for interviews and for your 1-minute elevator chat. Best of all, because everybody else in the club is in the same situation, it is a safe and fun place to practice – much better so than a meeting with your boss! These skills truly distinguish you from your peers. I would urge you to check if there is a club near you. Go along to a meeting. Listen to some of the prepared speeches from people of all abilities and decide if you want to participate. The worst that can happen is that you will be inspired! 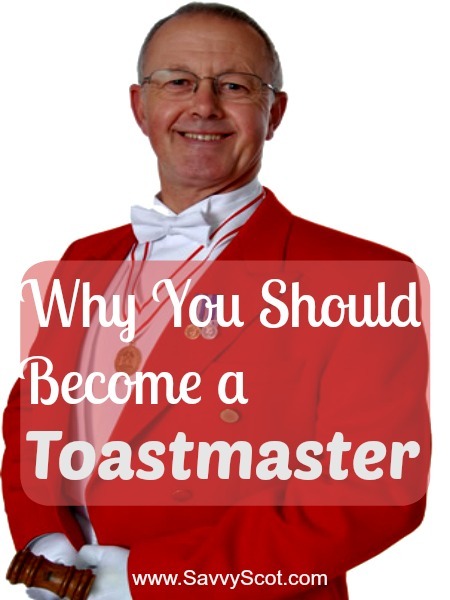 Have you ever been to Toastmasters or do you like the idea? Toastmasters is a great concept, but I’m much too nervous with public speaking to even attend something like that. I don’t think the name is so bad for someone like me who has no idea who that guy in the red suit is. To me I always associated the name with someone who just wants to get good at speeches for something like a wedding toast. How big is the group at your work? The group at work is currently about 30 which is great. TM will provide you a great learning environment though. Even if you are shy, you can learn from others without having to speak. You will often find that they are just as nervous as you. You know most people would rather die that stand up in front of a group of people and give a speech……………… I figure that’s why they pay people like me the big bucks LOL. I think everyone should have some “presentation skills” training – how you project yourself to the outside world is so important. Mind you, that could just be the old Stage Manager in me speaking? Agreed! These are the sorts of skills that should be taught in schools. I remember having to get up and talk, whether I liked it or not! It is harder when you are an adult to make a start at improving these skills, however Toastmasters really does help create a safe place to learn. Wow, this couldn’t have come at a better time. I actually was looking into this just last week. I have a tough time with public speaking because my voice starts to sound like it’s quivering…it’s hard to control once it starts up, and it all depends on my mentality. If I feel like people are scrutinizing me and I’m under complete pressure, it’s all downhill from there. I really want to check out Toastmasters. Please do! Let me know if you find it useful! I’m in Toastmasters and have been since December. It’s a great program and I love the members in my club, they are so supportive. The speeches are tough, but they’re there to help you the whole way through. Great to hear another blogger is involved 🙂 – How many of your CC speechs have you done? I totally agree. No other skill is so widely available to learn, so wildly successful once learned and so weirdly scary to learn. I joined toastmasters 8 months ago after dropping out of college and striking out on my own. It was a scary and I knew I needed some education that I could take to the real world. Public speaking is an incredible tool to have…it was scary for me…but now, I am on my way to becoming a great speaker! Hey Drew! – Glad you are a fellow TM. You are so right – it is undoubtedly the skill that, once learned, will advance your career the fastest! How are you getting on with the CC program?